Sputnik produces very attractive tomatoes, bronze and burnt orange with the deep olive green shoulders. Heirloom Seed Packet. 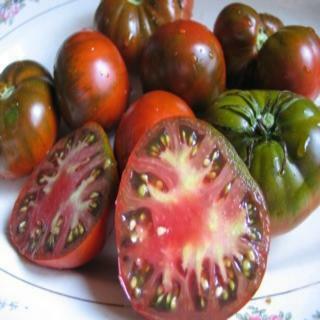 With terrific classic black flavor, you'll get a kick out of Sputnik heirloom tomatoes! Sputnik flies through the air with all different shapes and sizes! Some are beefsteak shape and others are little globes or plum shaped. Very attractive fruits are bronze and burnt orange with the deep olive green shoulders.